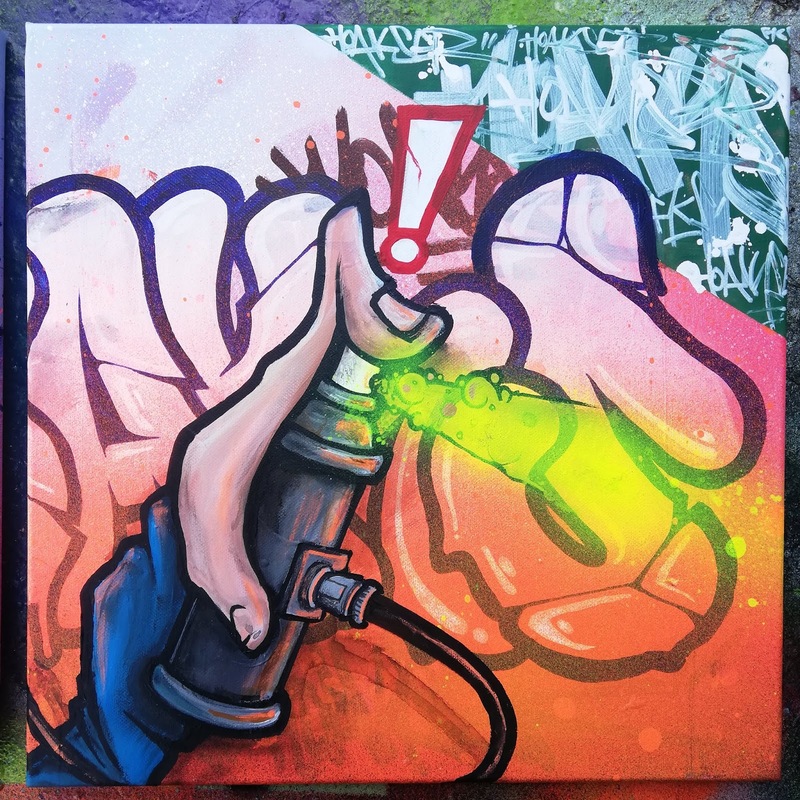 GoldenNeon...That word I had to make up for a colour that doesn't exist yet.. 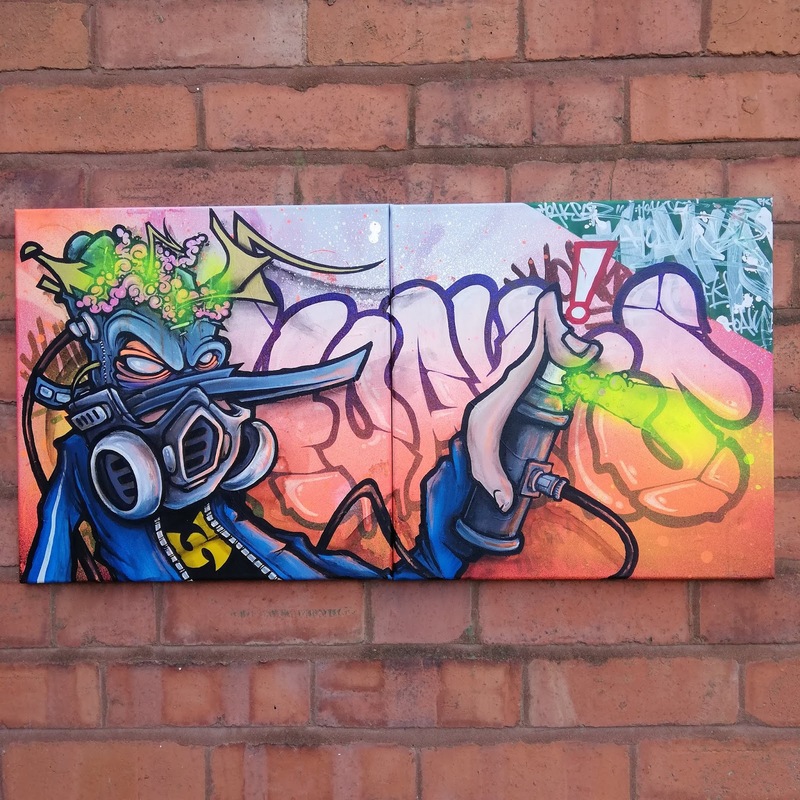 Painted across 2 40x40 cm canvases, this latest piece of that masked character I often paint has a mixture of fluorescent neon paints and shiny metallic gold.. 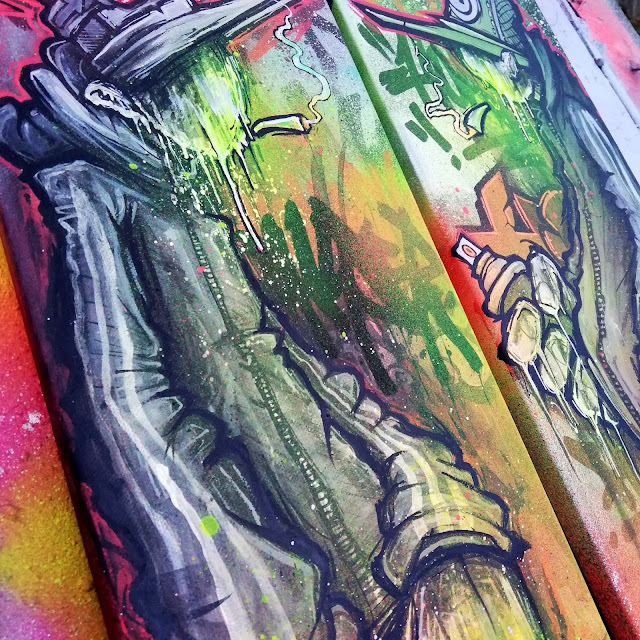 Possibly the brightest, most eye catching painting I've ever done that hurt and strained my eyes when working on it up close.. 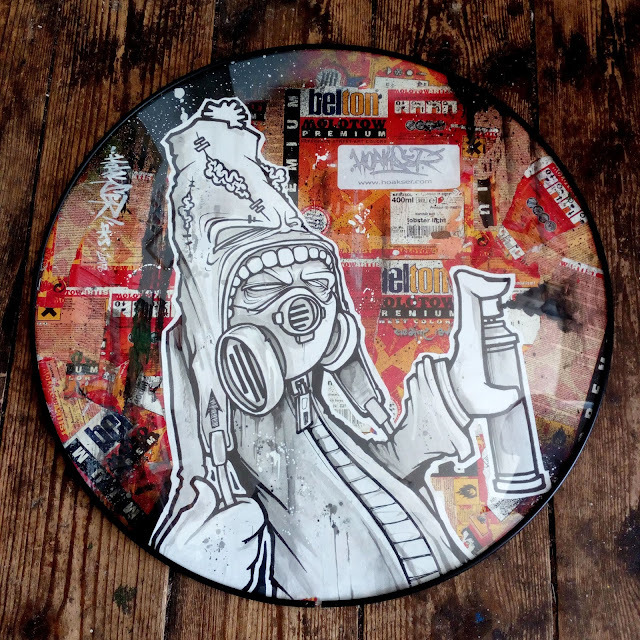 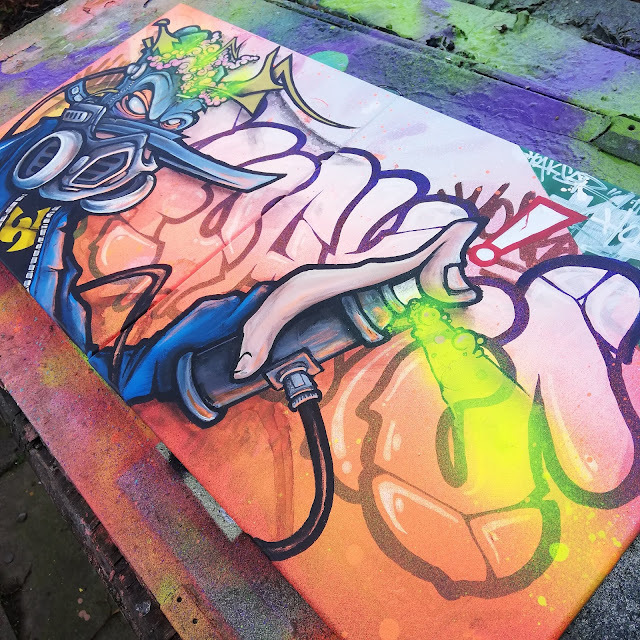 This one didn't get to hang around and light up my studio wall space for too long as it was purchased by someone within hours of it being posted on social media..For a long time while painting this I wasn't too convinced of the colour choices but mixing metallic with neon is something I'll definitely be experimenting with more often in the future..
Spray Cans with Dirty Faces? 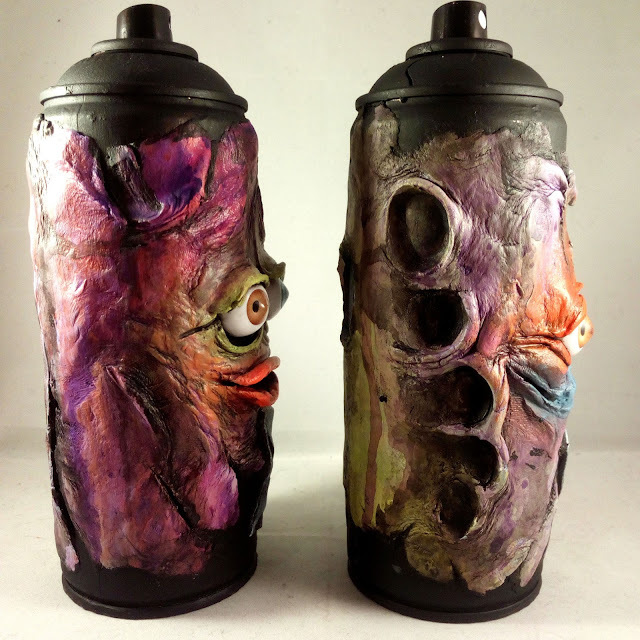 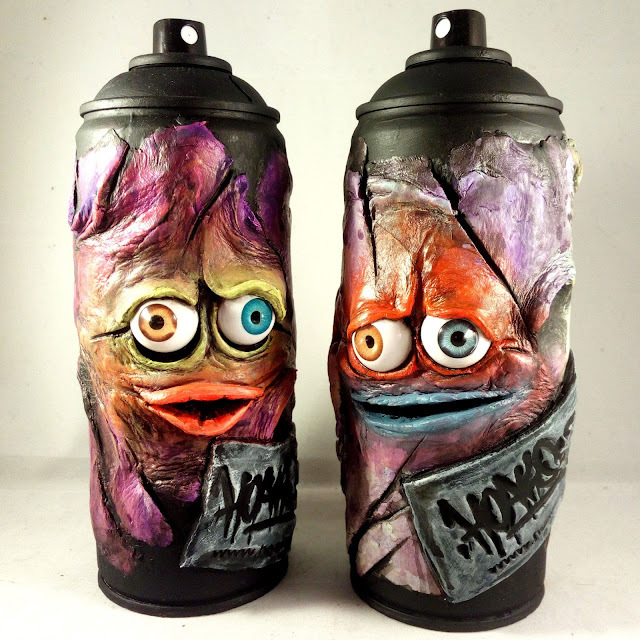 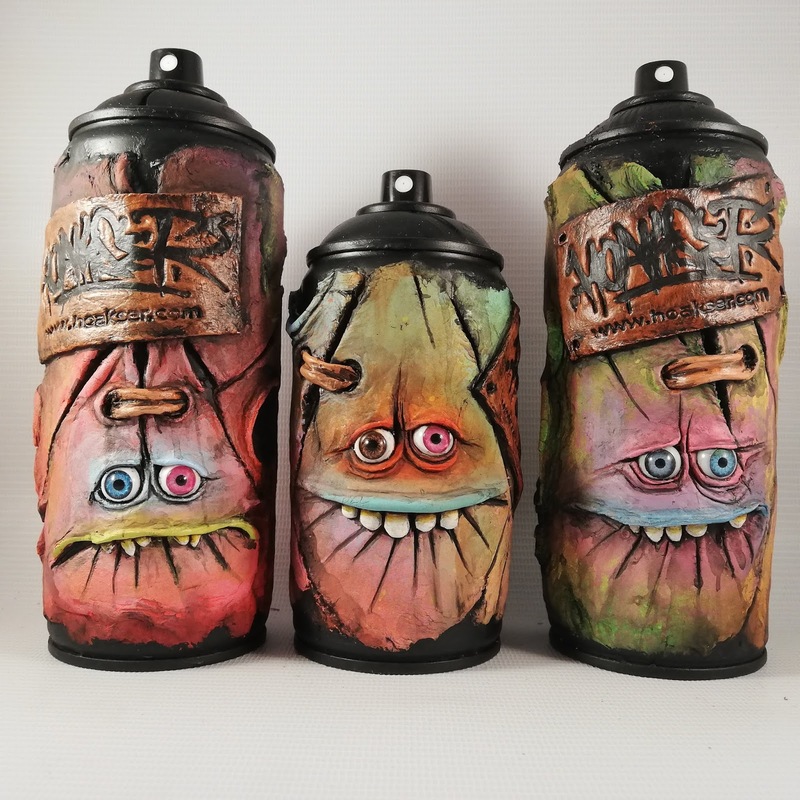 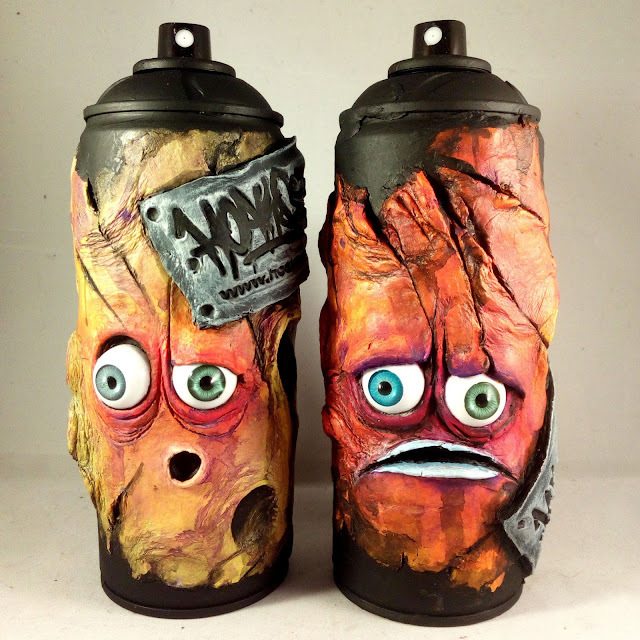 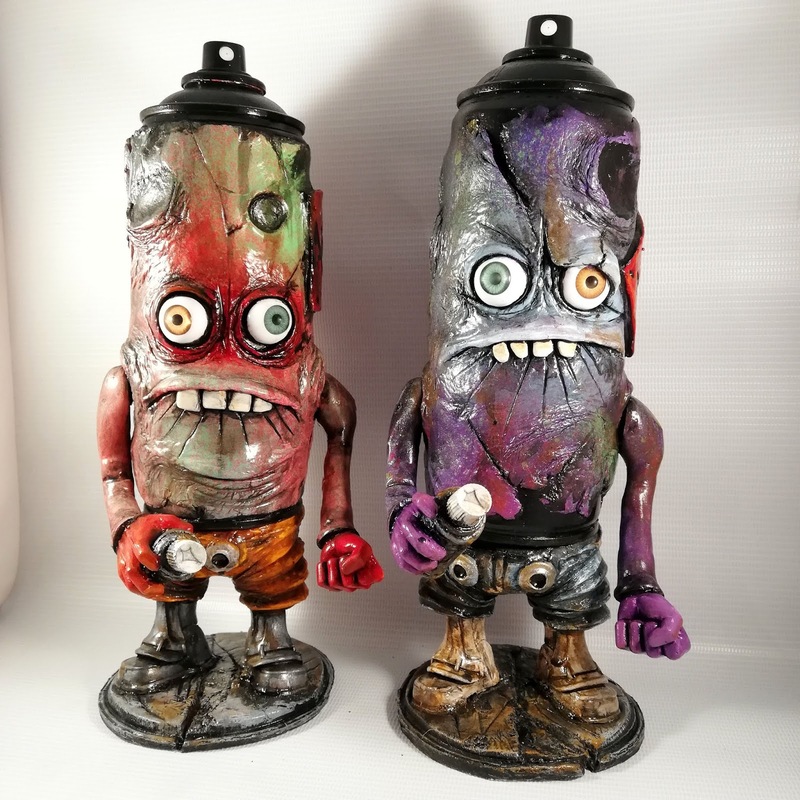 More empty cans that once upon a time had the life squeezed out of them and were destined for the bin or left to rust where they were rendered useless , now look like this.. Sculpted onto and hand painted with spray paint and acrylics, these one of a kind cans have real eyes, that aren't really real but they still follow you around and sleep when nobody is watching..
Each can is burst open and pierced with a small hole so they are 100% empty / depressurized making them safe and legally allowed to be sent in the post around the world.. To see what pieces are currently available please take a look around my ebay and etsy stores..
More drippy faced experiments have just finished drying and this is what they look like.. Painted with layers of spray paint and acrylics, these 2 paintings were worked on simultaneously and built up until I thought they both looked as finished as the other..Each canvas measures 60cm x 20cm and both are currently available from my etsy store..
A fresh batch of resin cast creations have been slowly getting cobbled together and completed on the paint bench lately.. 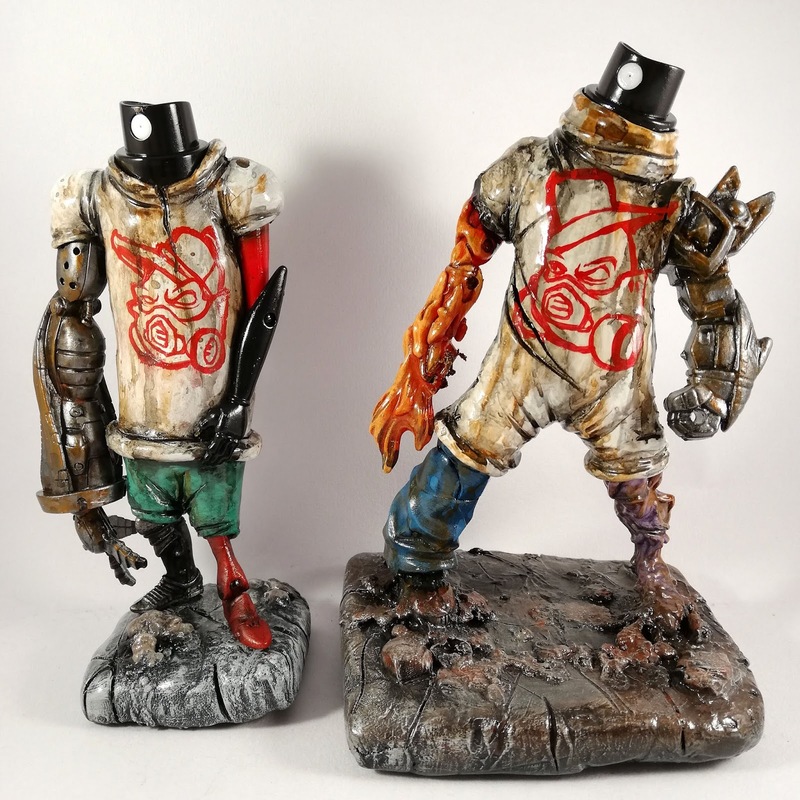 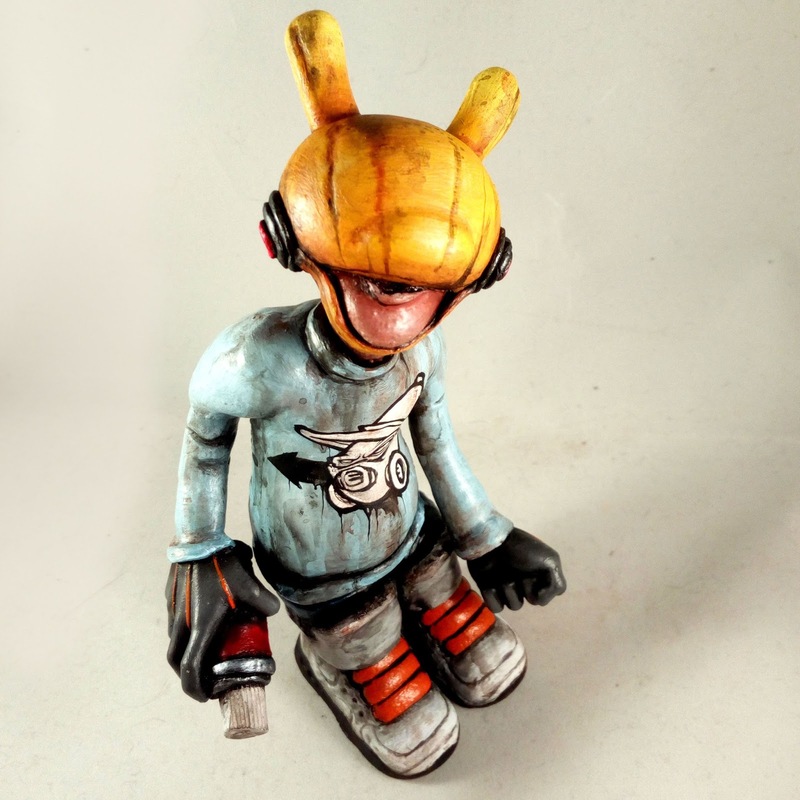 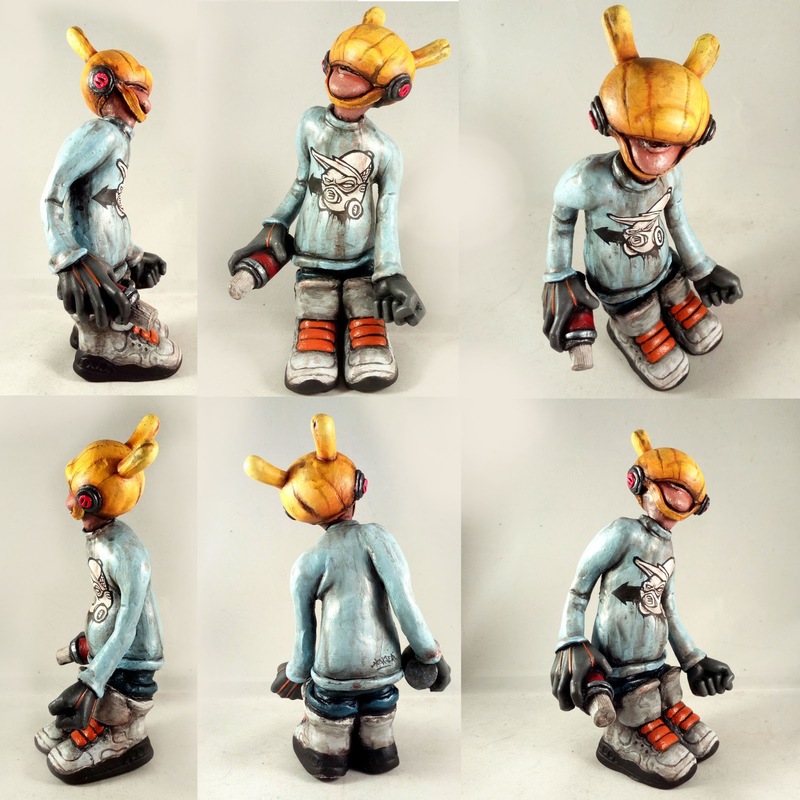 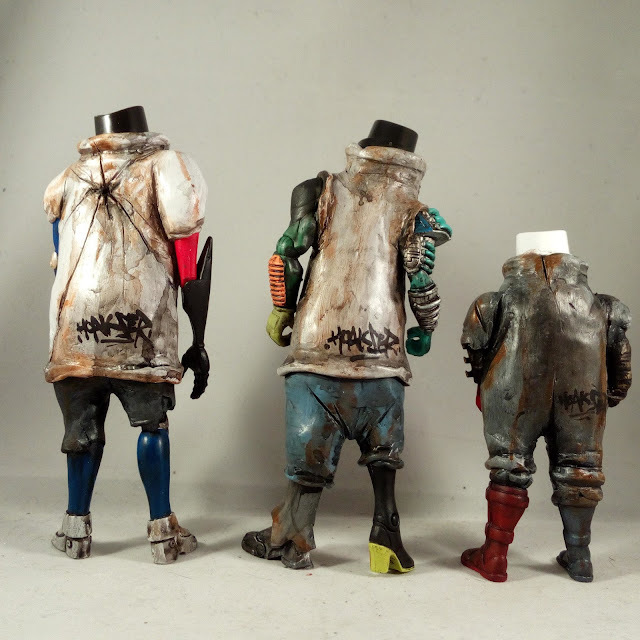 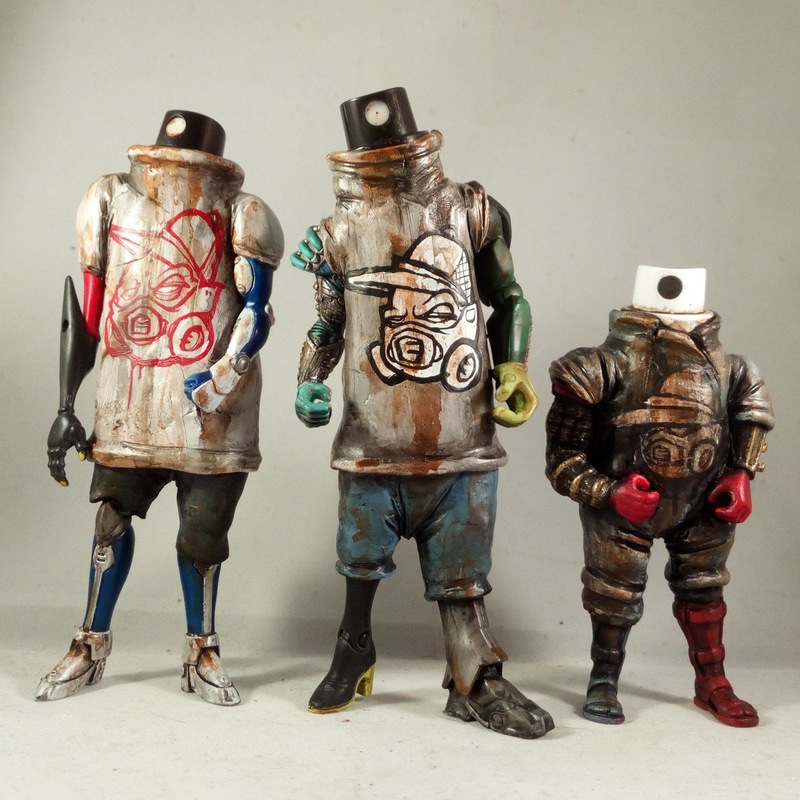 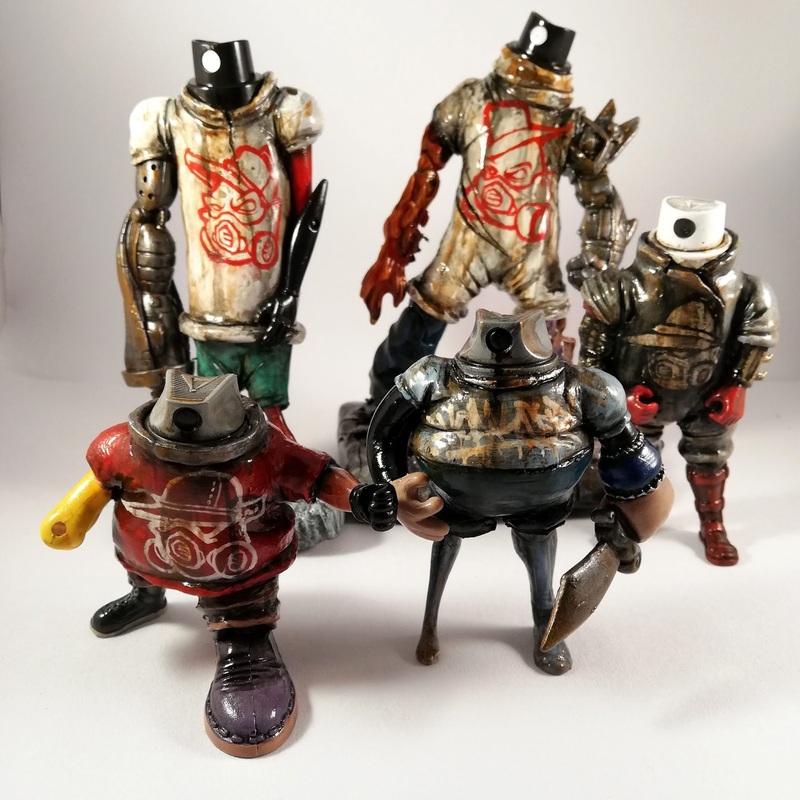 These 5 figures stand approximately 20cm tall and combine hand cast resin parts with additional sculpture, bringing everything together and also adding a few extra details. 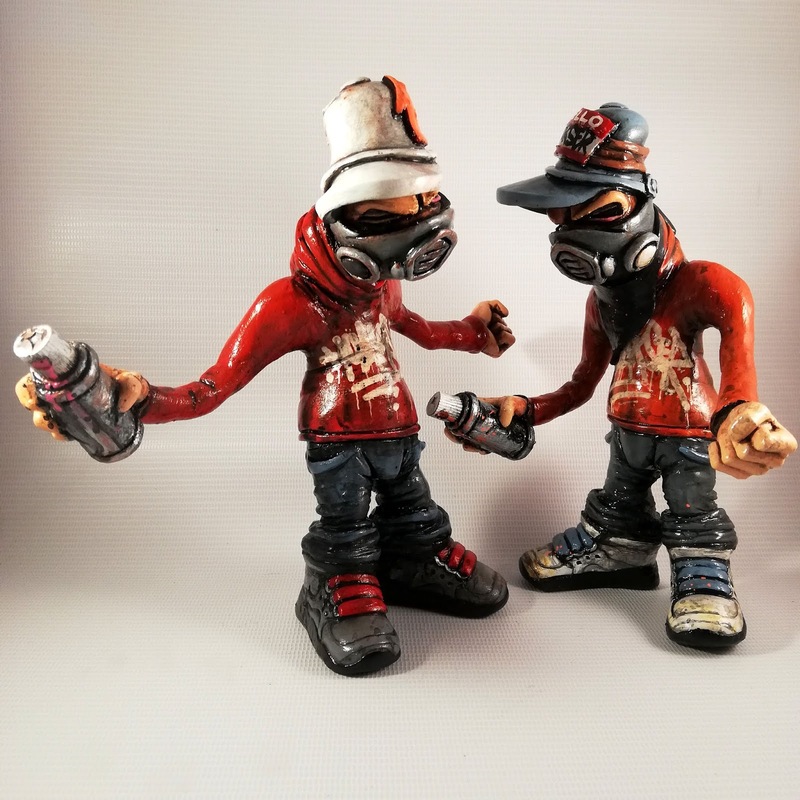 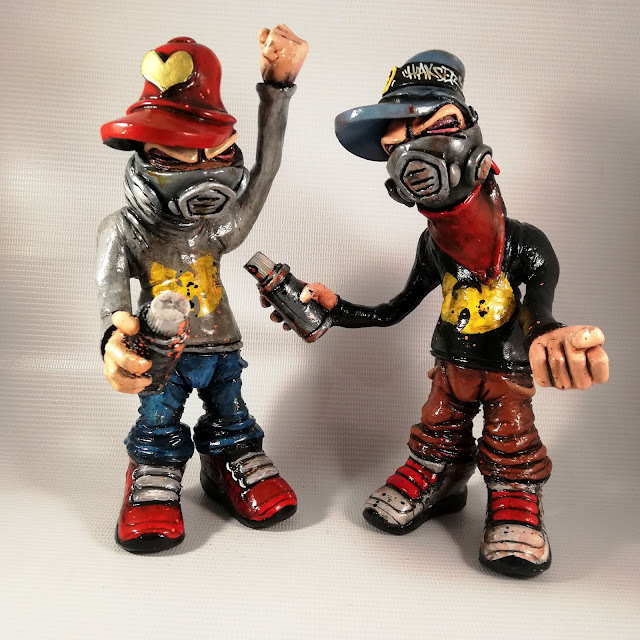 Each one is a unique version with no articulation and has been painted with acrylics before finishing with a gloss lacquer..
Whilst painting these 2 Wu versions, it dawned on me that this character turns 20 years old this year, with the first one being scribbled on paper in 1999, wearing the legendary Wu Tang hoodie..
For me personally, making figures of this character is why I started to teach myself sculpting all those years ago., because I wanted to own one myself for some reason? 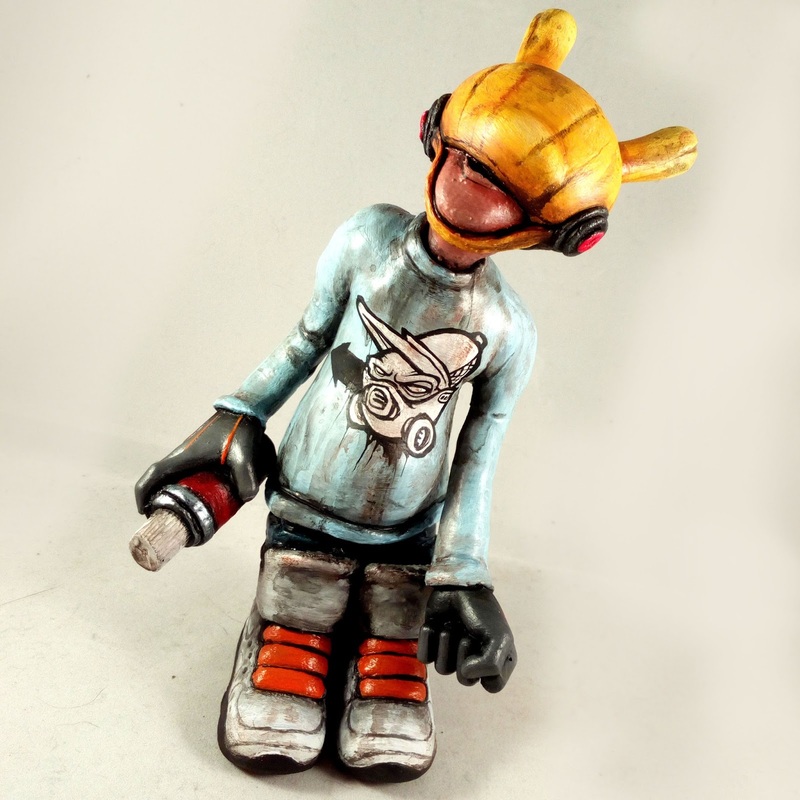 The thought that these plastic/resin forms will outlive any versions of this character I've sprayed onto a wall over the years is one of the main things that appeals to me about making more permanent work such as these. 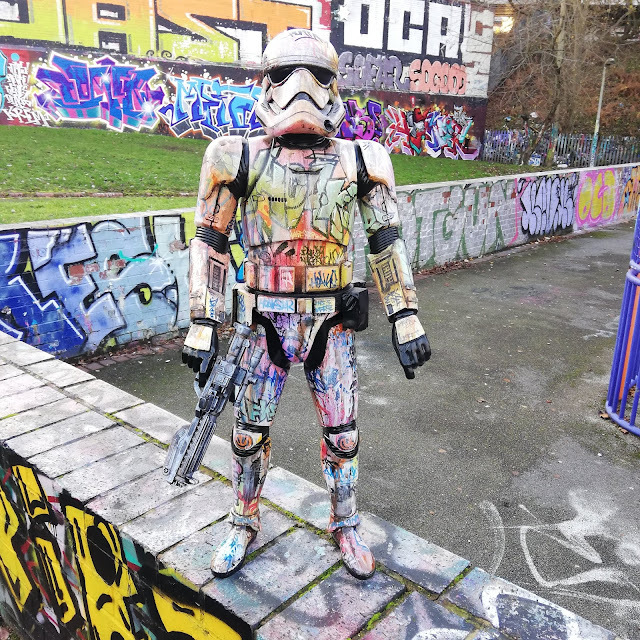 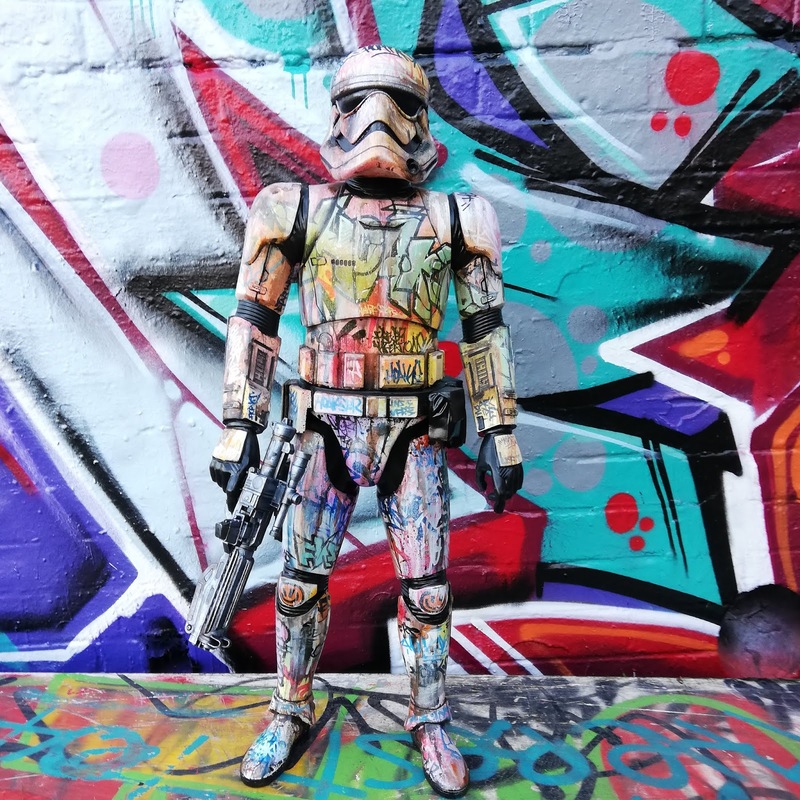 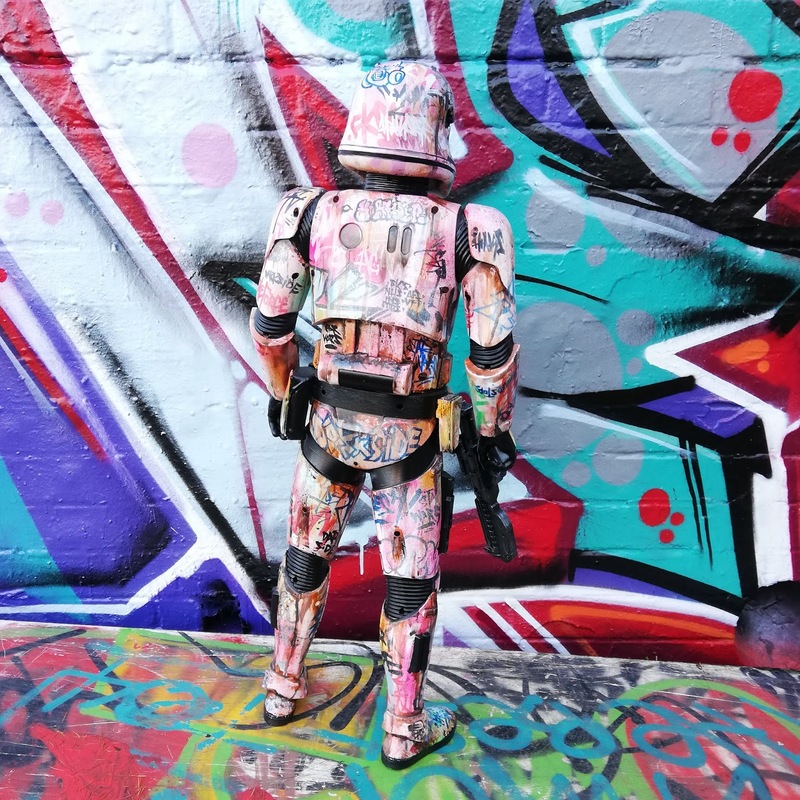 This giant 31 inch figure got given quite a few layers of paint treatment recently, turning it into the first Graff Camo Storm Trooper of it's kind.. 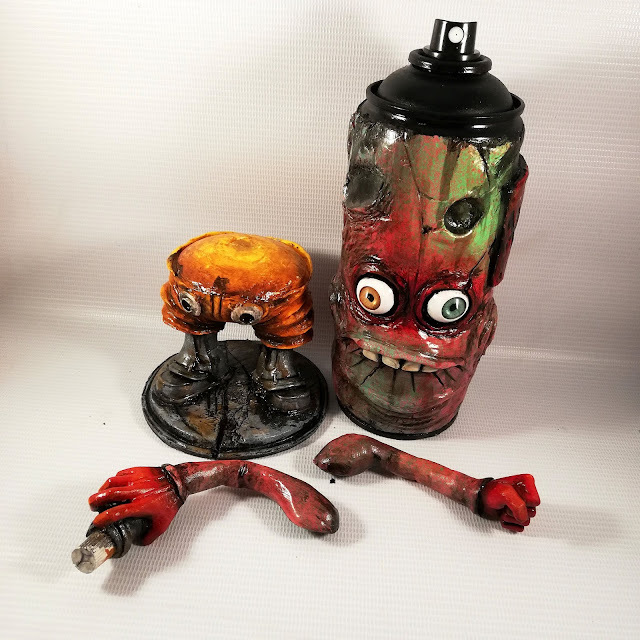 Covered in tags, throwups and pieces painted with spray paint and acrylics and given several weathering / rust washes before being finished with a few coats of gloss lacquer.. Currently available from my ebay store in a galaxy not too far away. 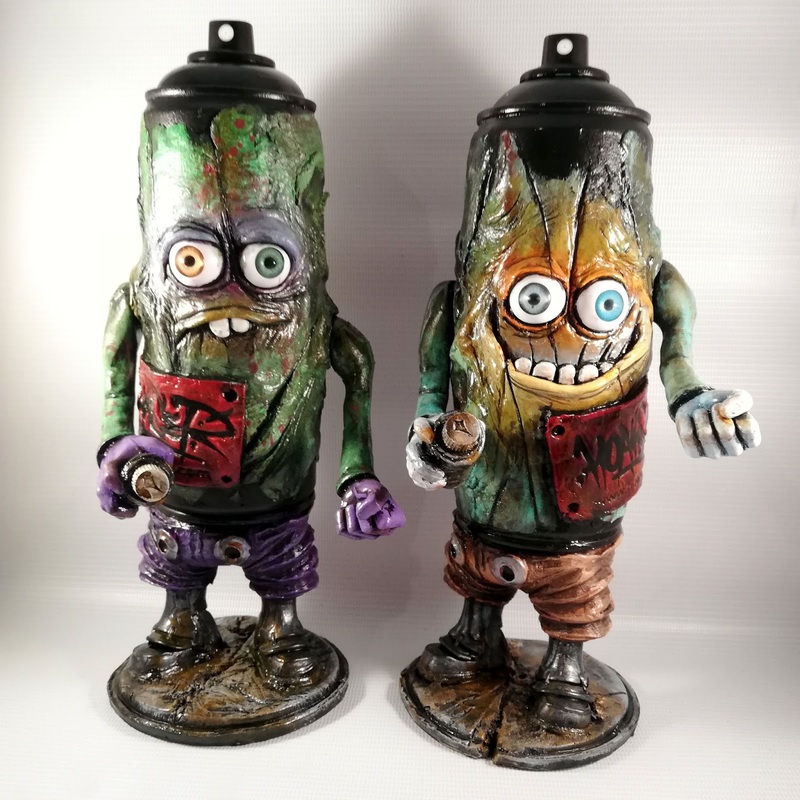 Standing 25 cm tall, these one of a kind spray cans equipped with their own spray cans were carefully made with a combination of recycled materials,original sculpture and resin cast parts..With powerful magnets embedded into their little limbs so they can move about, each can is a unique sculpture which has been been hand painted with spray paints and acrylics before finishing with gloss lacquer..
A gang of new mashups made with a combination of toy parts and original sculpture have recently been finished and added to the store..
Cobbled together with the limbs of broken / recycled toys, these weird little mashup characters were made from other characters so they could claim a space for me, on somebody's shelf, somewhere in the world..
Over the years lots of these nozzle headed objects have made there way into peoples homes and collections, if you'd like to see more of these you can find them in the gallery section of my site for kitbashed sculptures here ..
Over the years lots of these nozzle headed objects have made there way into peoples homes and collections, if you'd like to see more you can find them in the gallery section of my site for kitbashed sculptures here .. 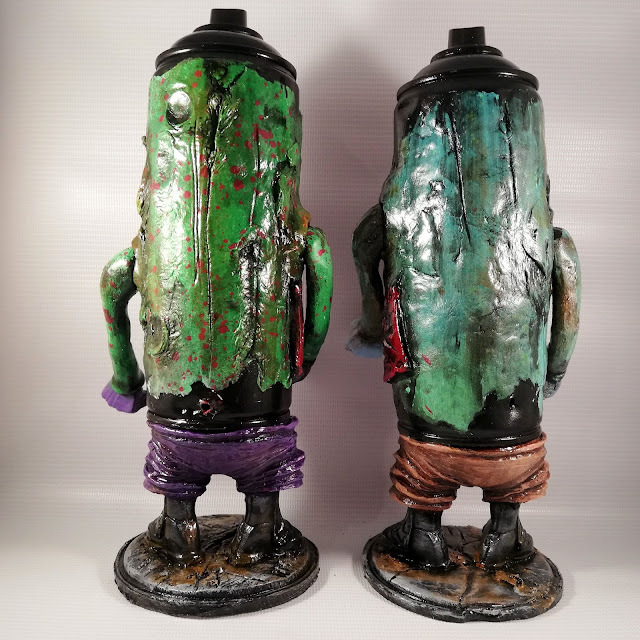 If you'd like to own one of these, they are currently available from my etsy store with free UK postage..Prices vary from £70 to £35 and all orders come with free stickers!! 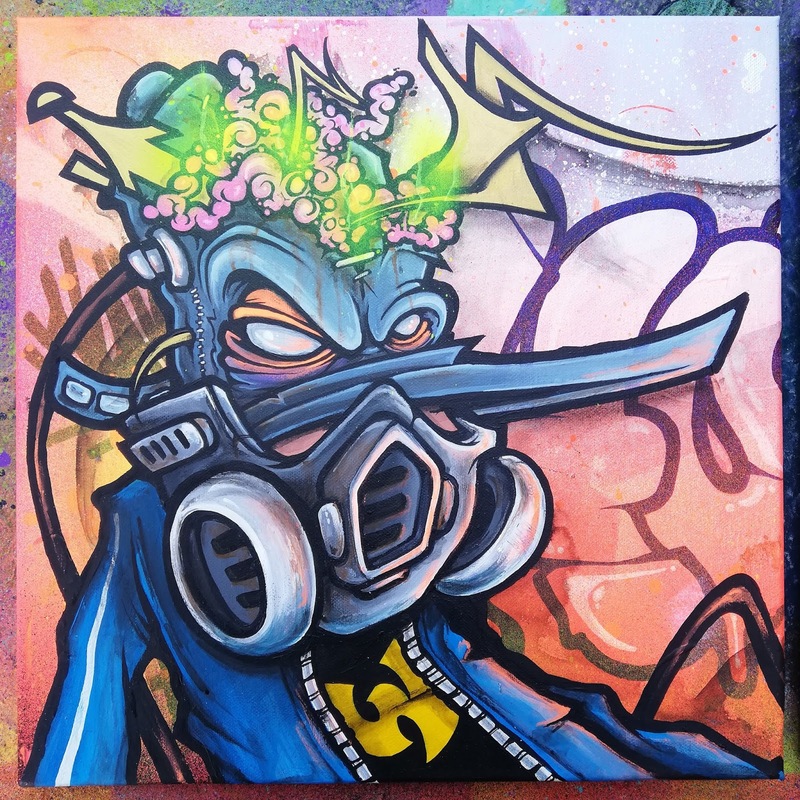 If you are reading this...Thanks for looking!! What no characters? It's been forever since painting a canvas that didn't have a character as the main focus, so recently I decided to drop a few 'just letters' paintings..Created with acrylics on spray painted backgrounds, these 60x20cm pieces were all freestyled (without a sketch) and worked on simultaneously..It was quite fun to work all three at the same time (and more productive) while one layer dried on one painting, I'd work on another until they were done..It's always interesting to see what colors can do to a piece and how they look next to each other..Personally I now prefer the bottom painting but for a while it was my least favourite, until some turquoise got added to the mix..Which ones your favourite?? 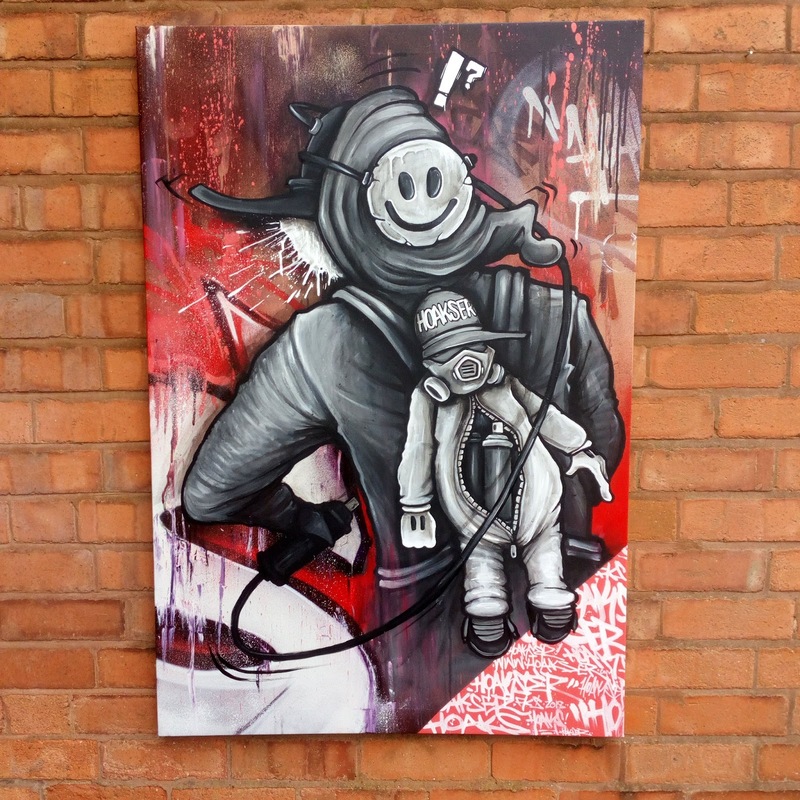 If you'd like to own one of these paintings.. they are now available from my etsy store.. with free UK postage.. 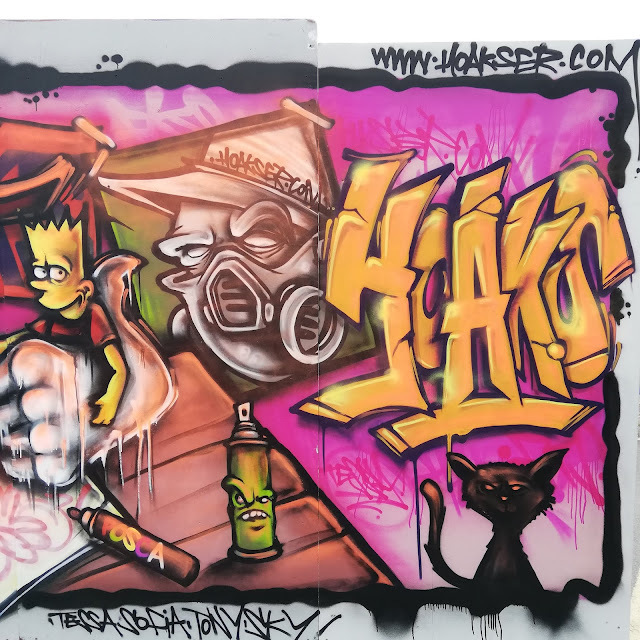 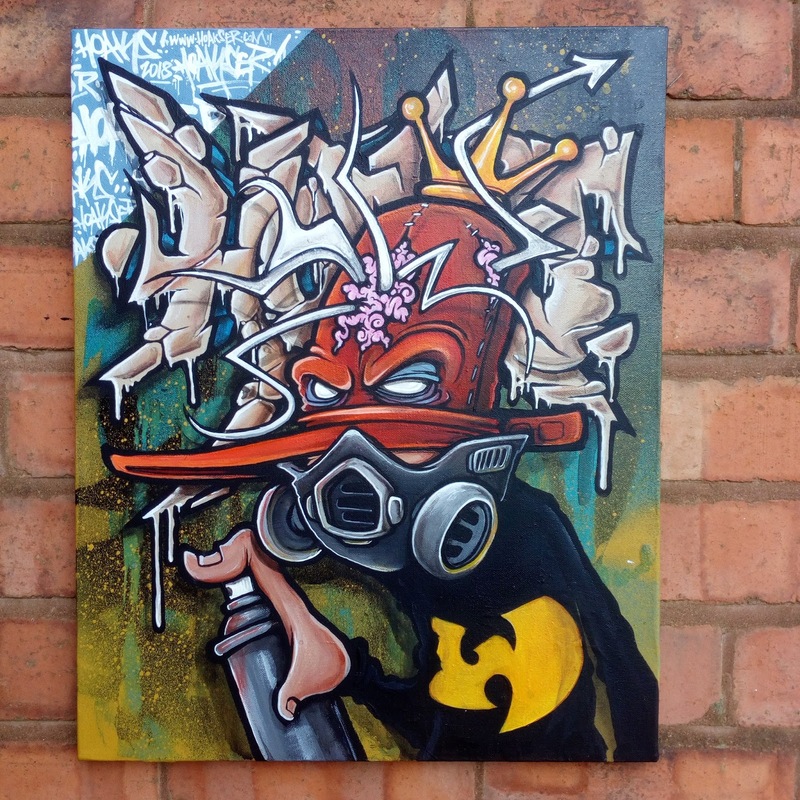 Following on from my last bloggy thing, here's what I painted at Upfest, and a quick ramble about what fun I had..For a few weeks leading up to the event the UK had nothing but sunshine and blue skies, but all that changed on the Saturday morning of day one when it decided to turn wet and windy..Day two was forecast as the same, if not worse, so I focused on getting mine up and done as fast as possible. 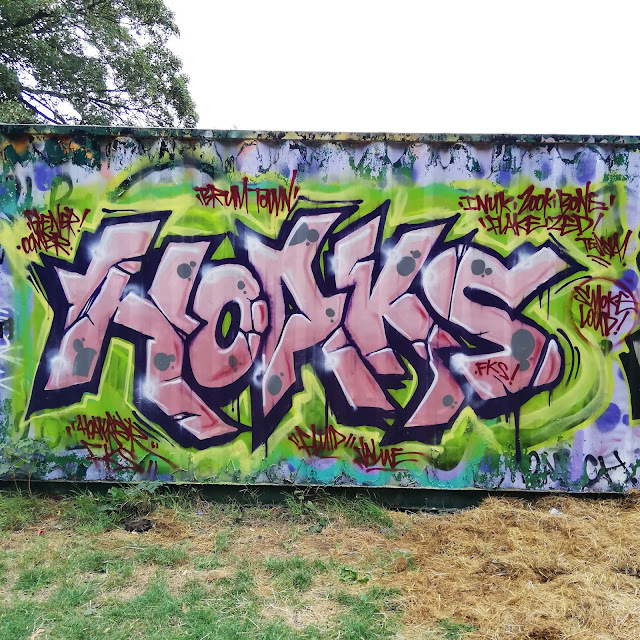 As usual I didn't have a solid plan of what to paint before I got there, so decided to paint what I thought would be possible before it rained. 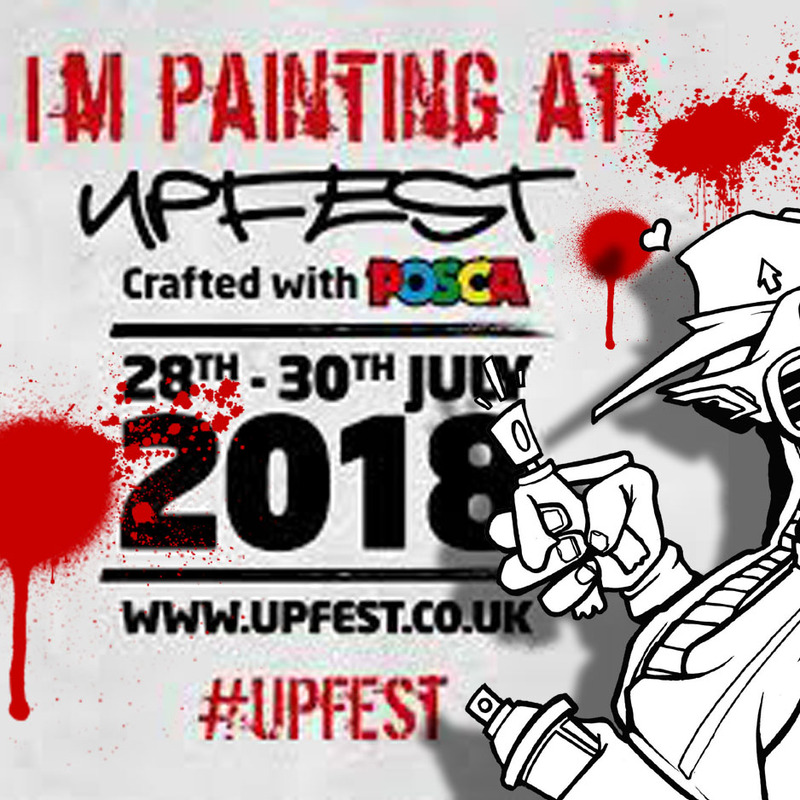 The Simpsons and Posca sponsored the event so I wanted to include them somehow. 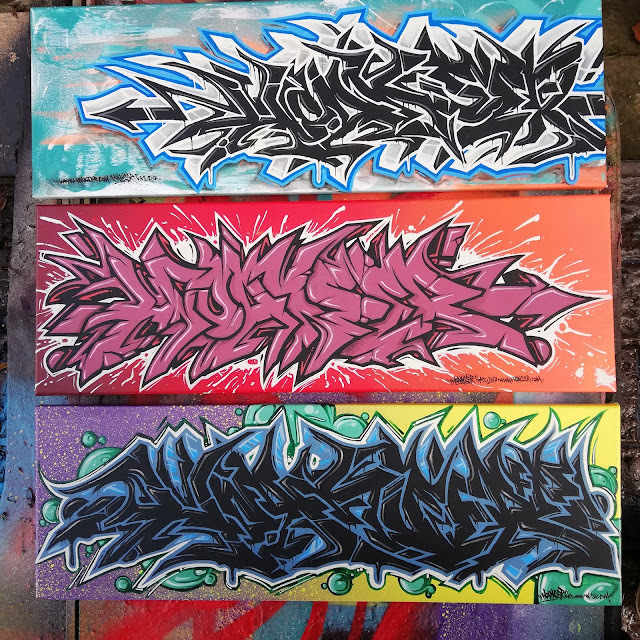 I also wanted to put up some letters, my masked character, a drippy face character, a sculpted can like the ones I had for sale there and put Dog (my cat) in somewhere too..After about 5 hours (with a break in between, while the nice staff put my boards back up due to stupid wind taking them down) I'd squished it all in and was done just before the heavy rain came to put an end to play on day one. 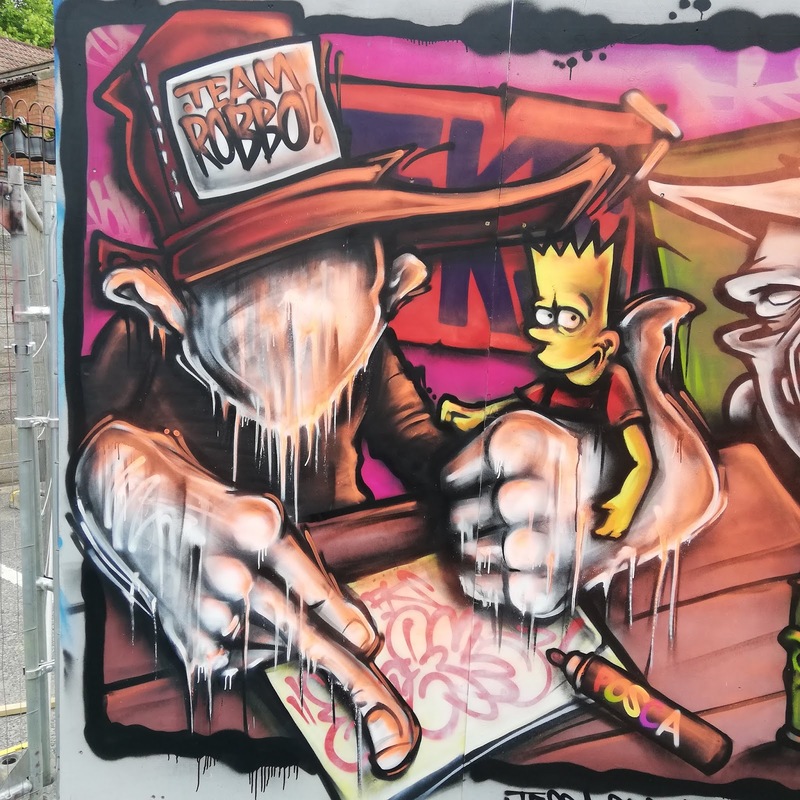 On day two I took the time to walk around and see most of the other artworks being created all over Bedminster for the festival..There was some really nice stuff getting painted up. Most of my favourite stuff to look at was work that was painted freehand..There was a lot of people using stencils, and if I'm honest I expected to see a bit more graffiti and a bit less street art than I did..It was way more fun to watch people painting freehand than people sticking masking tape up and trying to stop the wind ripping their stencils..Nothing against stencil work, I did see a few good ones, they just don't really do it for me. 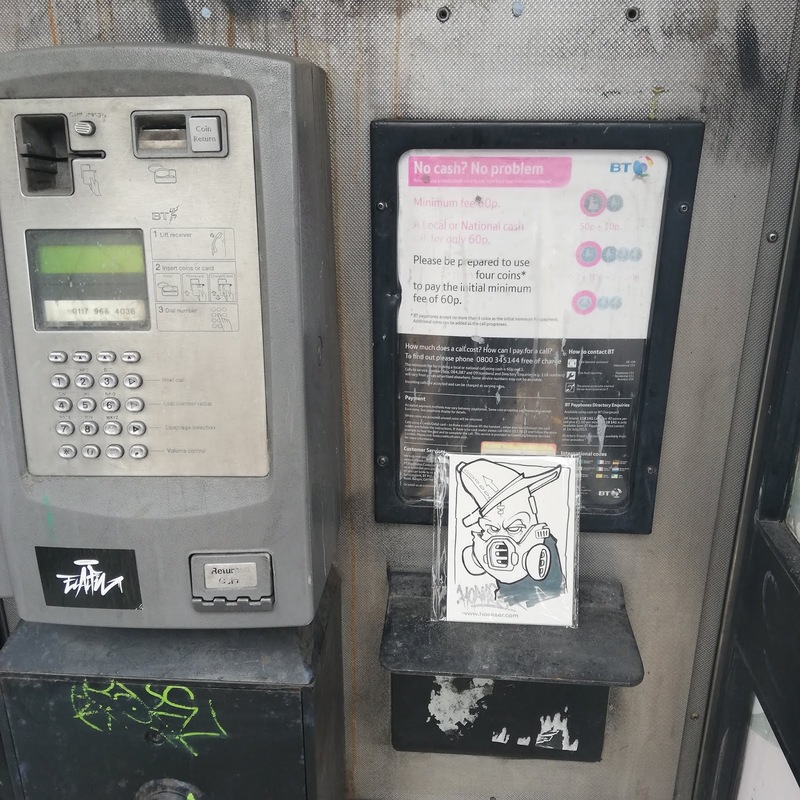 Anyway, whilst walking about I dropped those 20 free sketch card sticker packs ( from the previous post ) around for people to find and started getting found it posts on Instagram almost immediately. 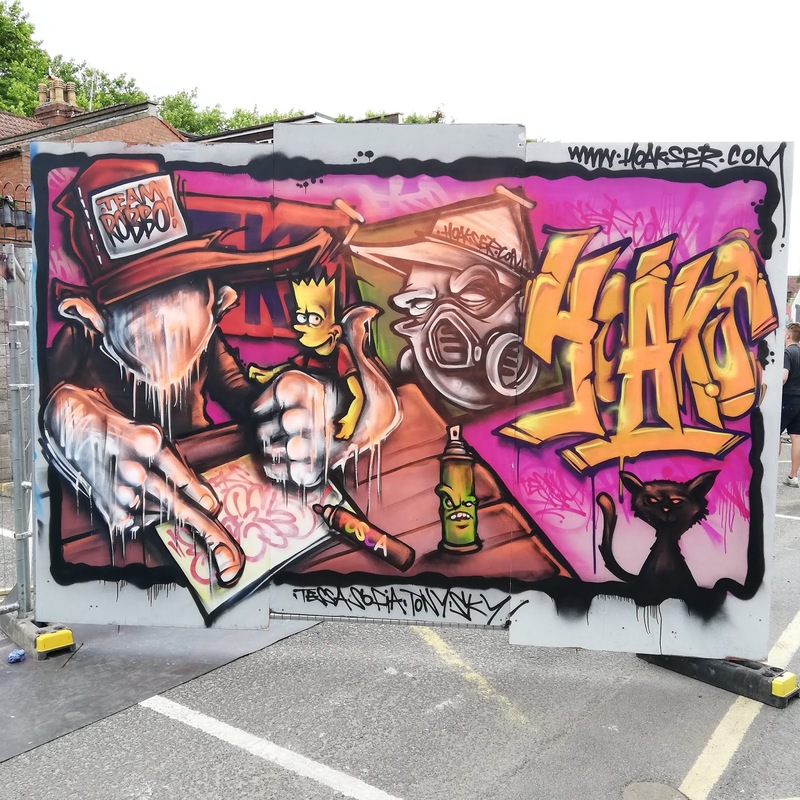 After a bit of that I went and dropped a quick painting on this freight container thing, which made my bag home slightly lighter..
Big thanks to the Upfest crew for having me! 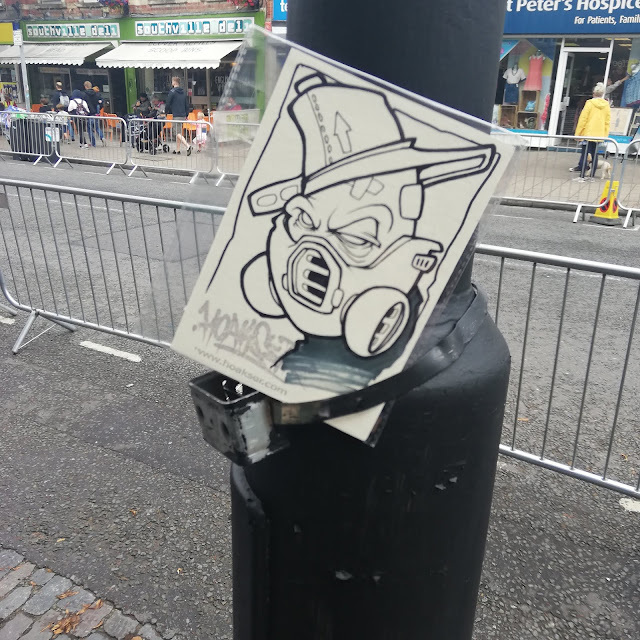 Shoutouts to all the artists who did their thing and to everyone else who was there too.. Check out the Upfest website www.upfest.co.uk/ for more info and the #upfest2018 hashtag on Instagram for lots of pictures of the event..
Another amount of time has been spent pushing paint around into the early hours of a few mornings, resulting in this latest painting on canvas.. Measuring a pretty big 118cm x 80cm, this piece was painted with a mixture of spray paint and acrylics and is packed with textures and techniques. 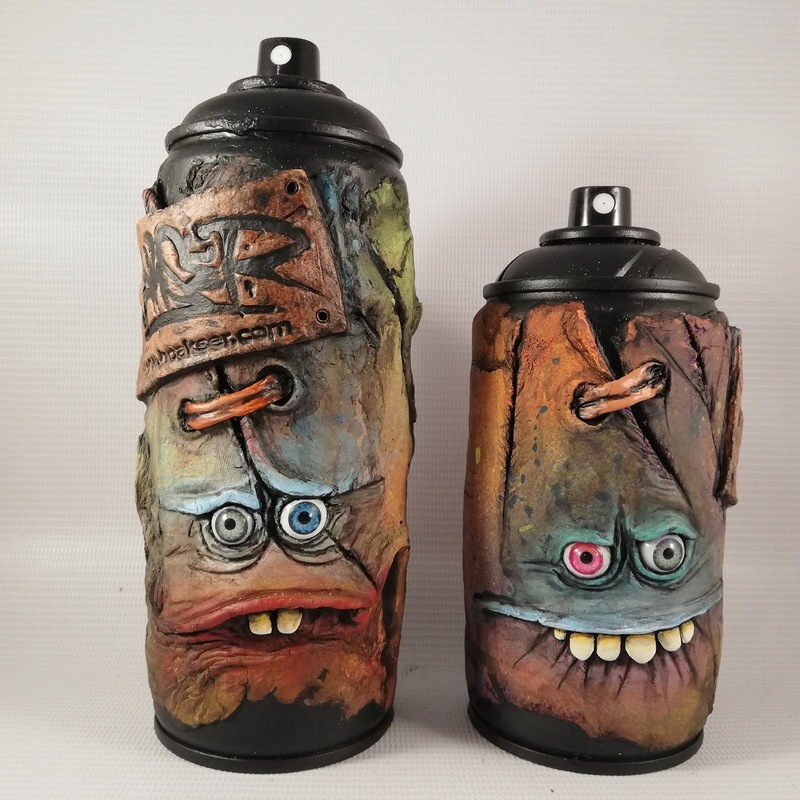 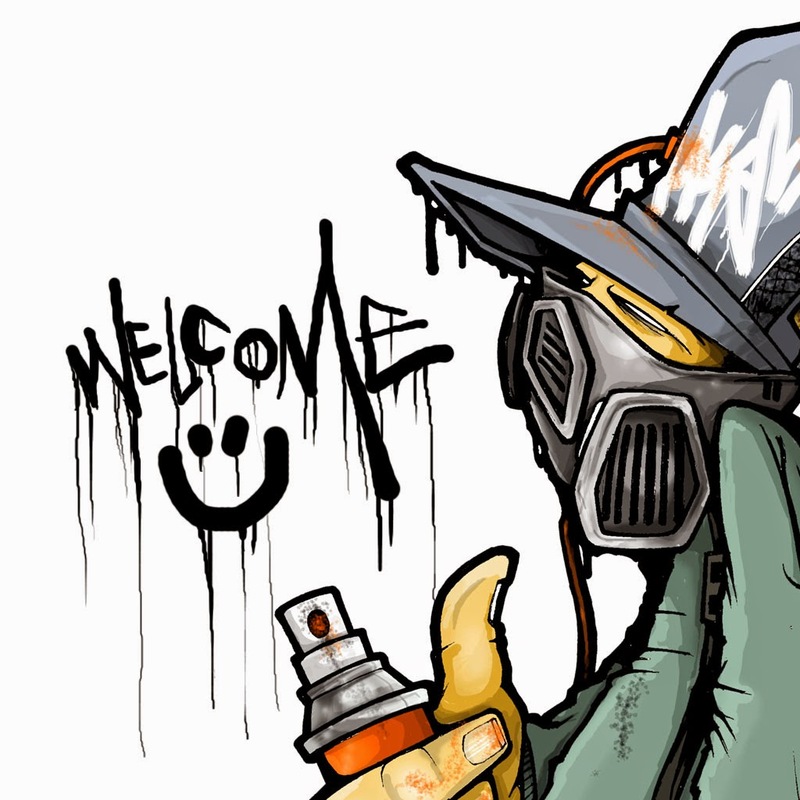 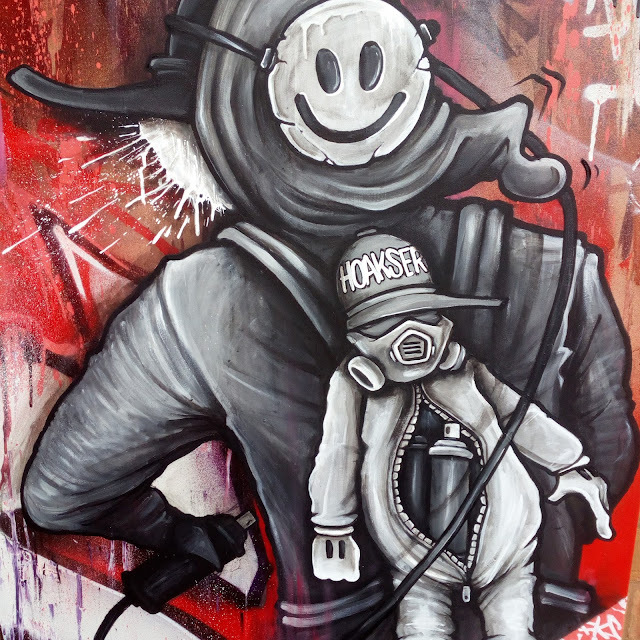 Featuring one of those drippy no faced characters with one of the best back packs I've ever seen that can open and close itself and reload you with a fresh can..I wish I had one of those!! 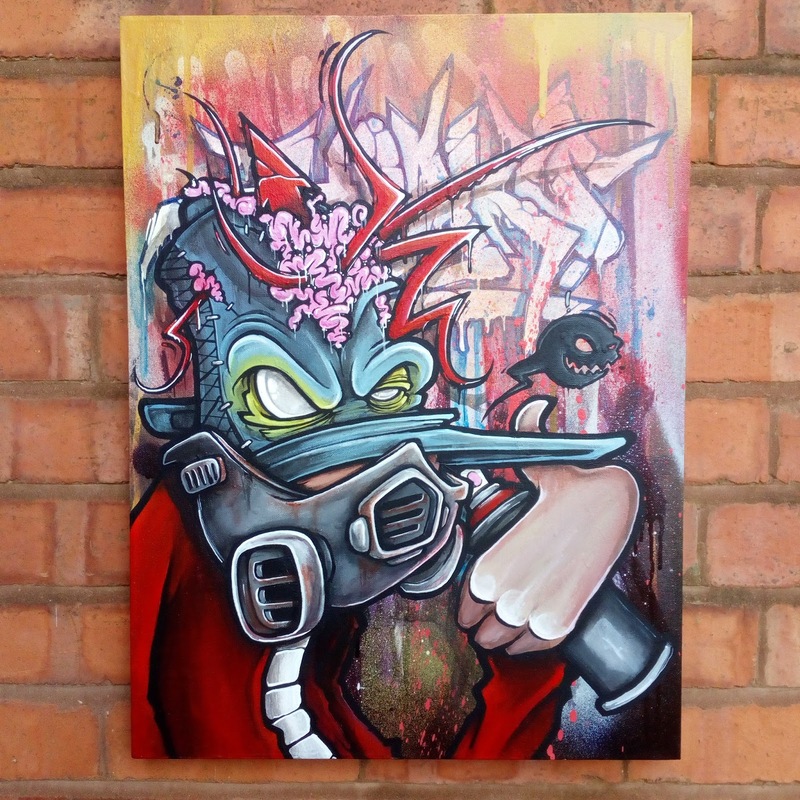 This painting is now available from my ebay store so if you'd like this to hang on your wall ,please head over there now to take a look.. 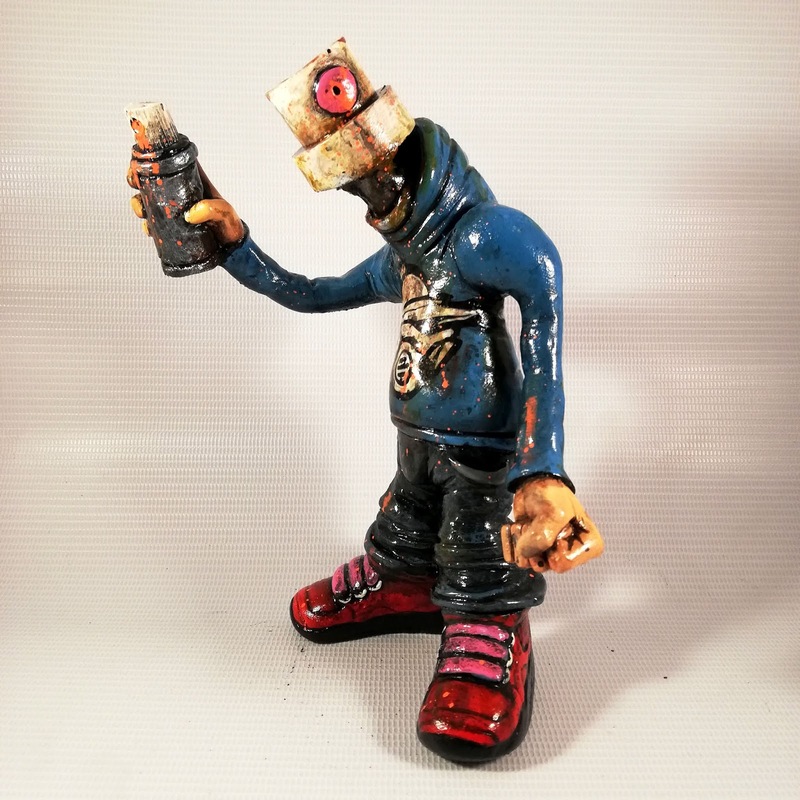 This 7.5 inch sculpture was one of those pieces that sat unfinished for around a year, didn't look anything like this for most of that time, and eventually got finished because I made myself do it..So having recently attached some arms to the body and feet that stood gathering dust, a resin cast of a Dunny head that sat around was given a human looking chin and a chin strap, which made him look a little bit like he might be plugged into the Oasis, Ready Player One style! If you've seen the film yet, you might have spotted quite a few paintings in the backgrounds?.I was lucky enough to work on painting these sets thanks to GraffitiArtist.com and having watched it the other night, was pleased to see some of my work get some Spielberg air time, in 3d on the big screen.. 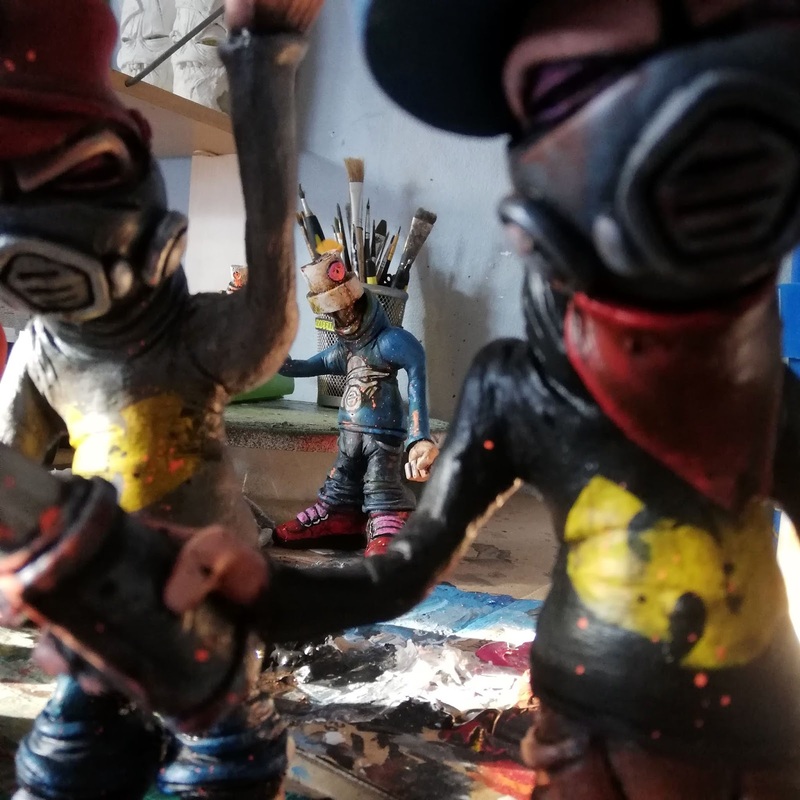 The picture below was posted on the official Ready Player One Instagram page with Steve himself, stood by a MadBall that I painted..How cool is that?? 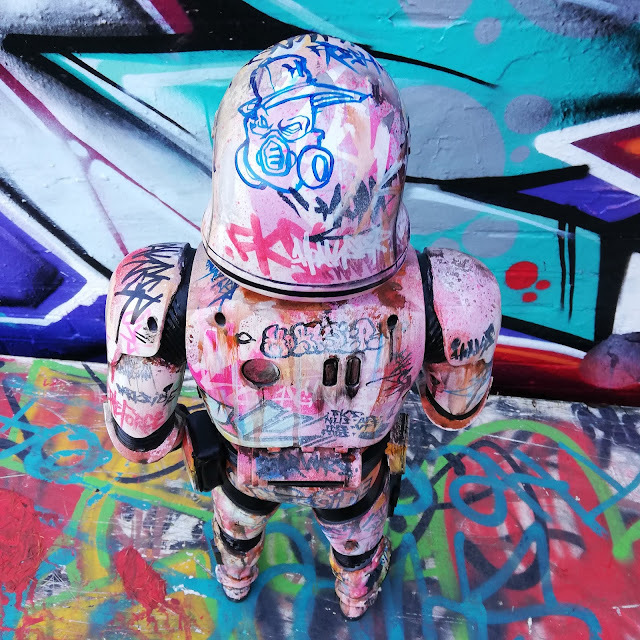 Enough about that for now though, I'll do a post about that soon, and just recommend that you go and watch it, because it's very good and full of cool stuff! 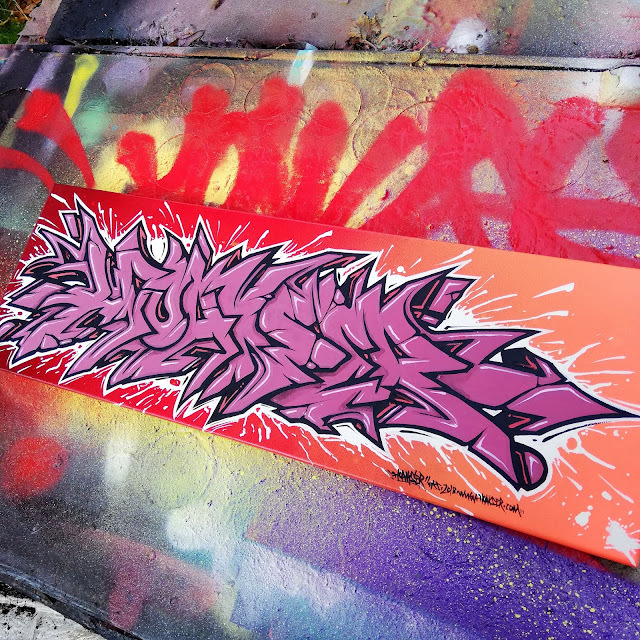 Back to the one off thing I made...Being forced to think of interesting things to say about something I've made isn't that easy..It can sometimes make you realize other things about your work or it can make you have to force a connection to a point you may not have known you were trying to make in the first place...However unintentionally ( or was it ) this guy has a Bunny shaped helmet perfect for hunting Easter Eggs, and also has haptic gloves for gripping his spray can with..If you don't know what this means, you haven't seen the film yet or read the book, which is also very good.. 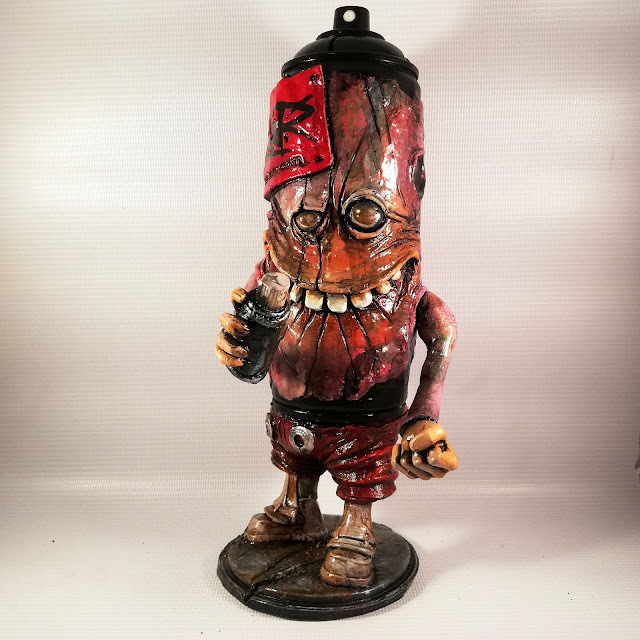 So there you have it.. that's how and sort of why this thing exists..If you'd like to own this, it's now available from my Bigcartel store!! 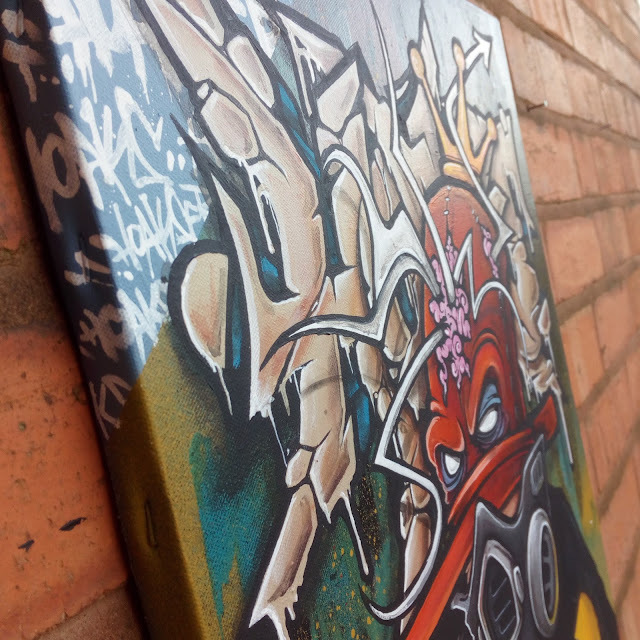 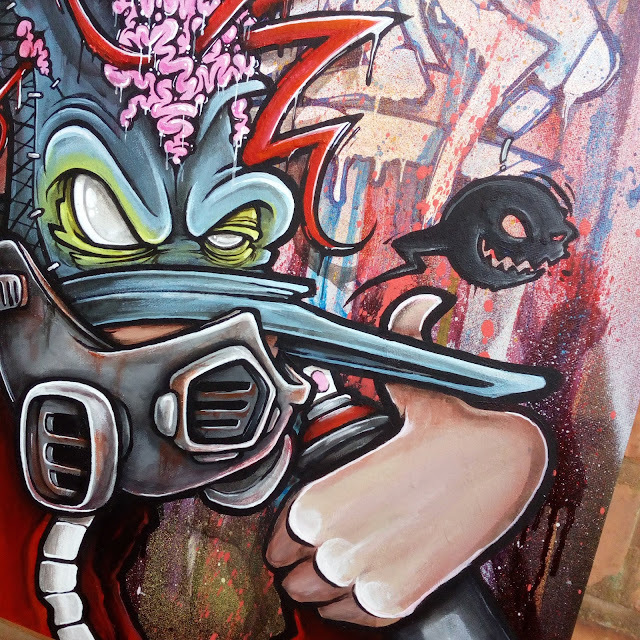 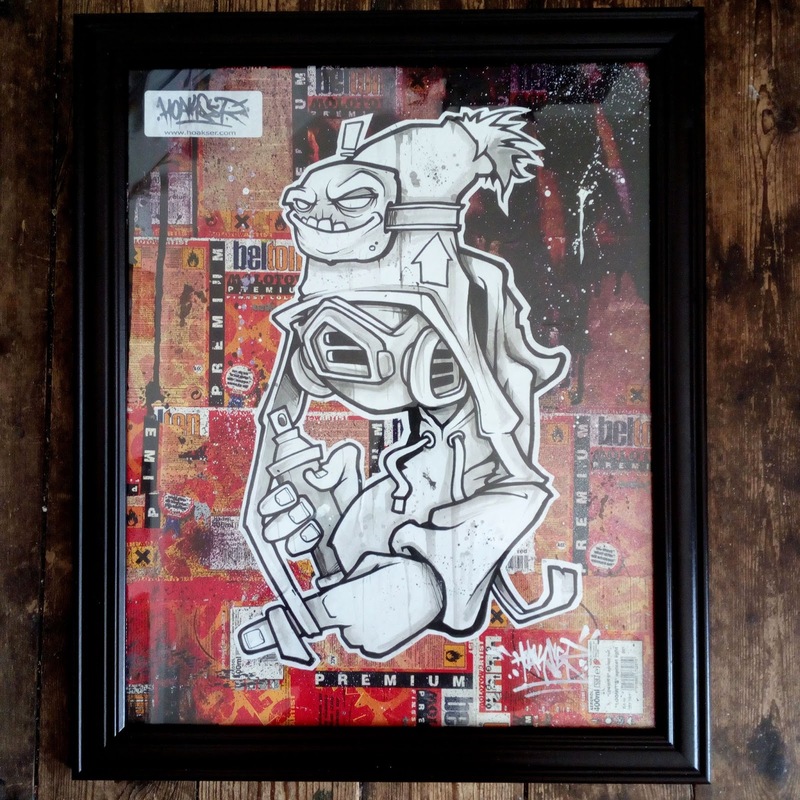 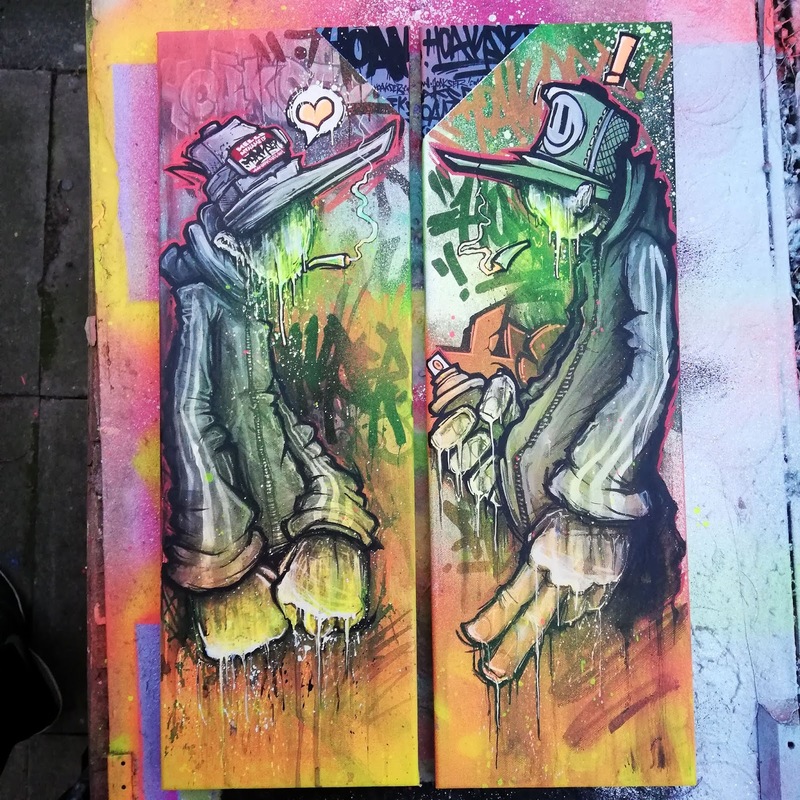 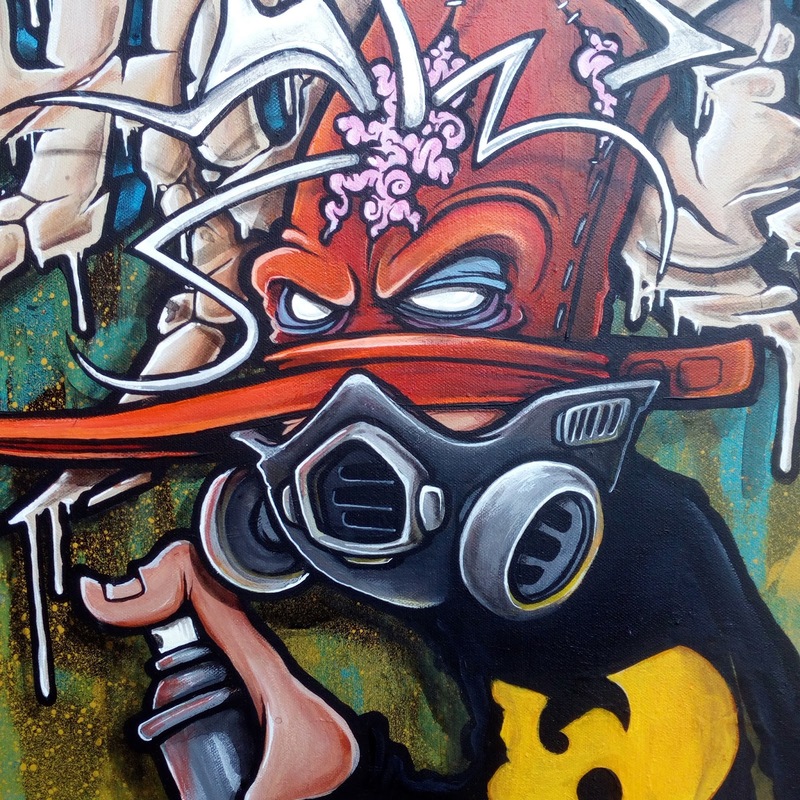 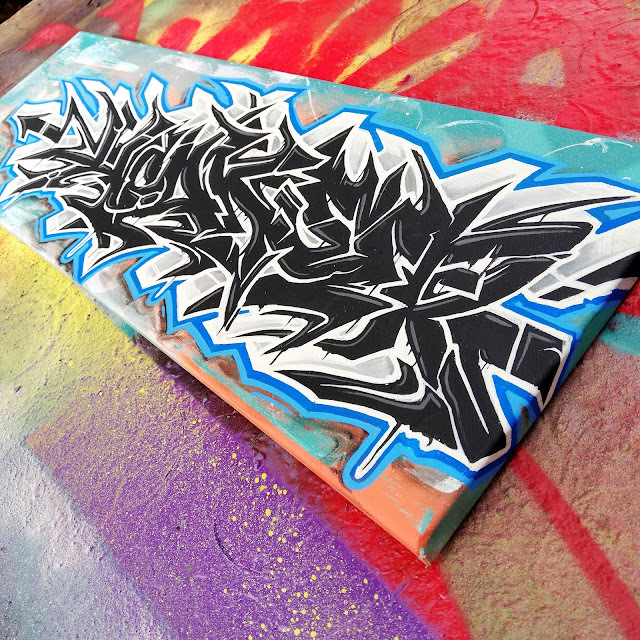 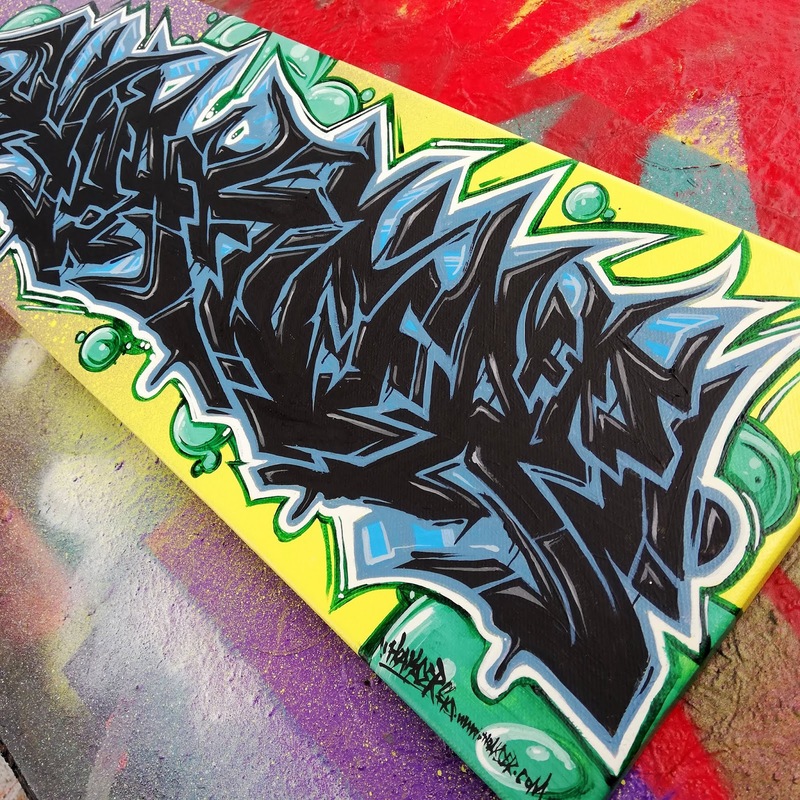 This 24 x 18 inch canvas is the latest piece of that character I do, painted with spray paint and acrylics..This version is equipped with a trusty spray can, a head full of ideas and a bad attitude. 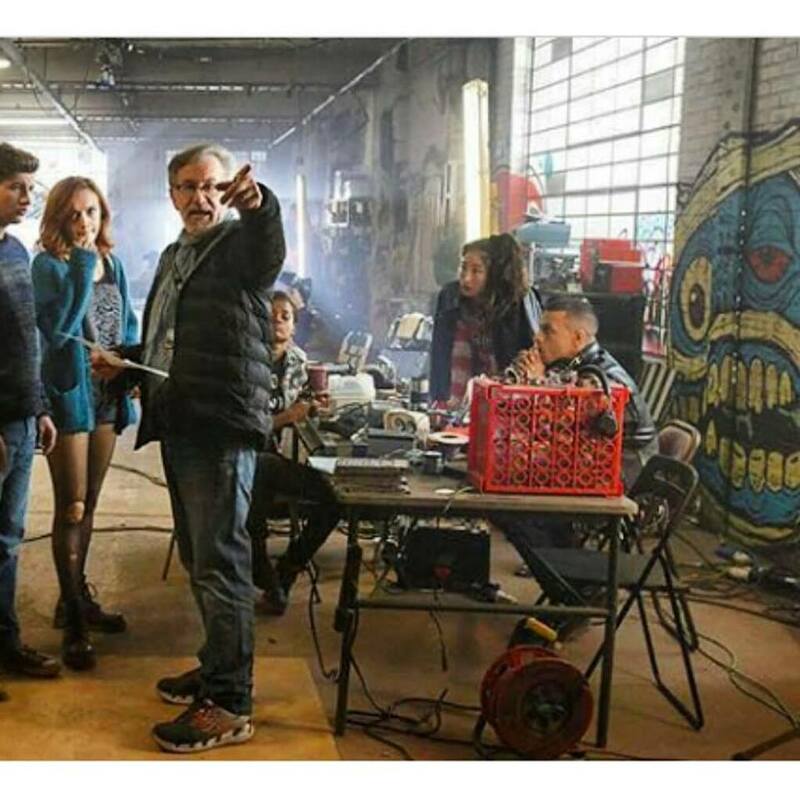 Whose wall will he get up on? If you'd like to hang this up on your wall, it's currently available from my Ebay store..Take a look around (here)..